There are many legacy systems that use X.25 as an underlying transport to higher layer application protocols, mainly for file transfer. This is particularly true for telecoms. In these cases, the topology is reversed: the branches are expensive legacy phone switches, connected to a lower cost gateway which communicates to a central host. To transfer billing records or CDRs (Call Detail Records) to a centralized billing collector, most of these switches use a file transfer protocol on top of X.25. Typically, Nortel switches use their proprietary XFER, AFT or AFTEIU. Lucent switches use Bellcor's AMATPS, while Alcatel, Ericsson and Siemens use ISO FTAM. But there is no fixed rule regarding which switches use which protocol. This XOT topology shows multiple switches using Cisco XOT clients converting to FTAM/X.25/TCP/IP through the telecom's intranet to a Cisco XOT server that converts FTAM/X.25/TCP/IP back to FTAM/X.25/V.35. 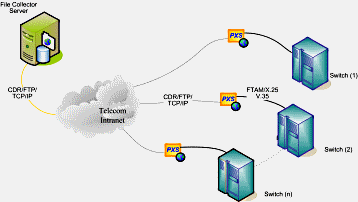 The centralized FTAM/X.25 to FTP/TCP/IP gateway uses the FTAM/X.25 protocol to communicate to the switches, and the FTP/TCP/IP protocol to communicate to the CDR file collector. The PXSe gateway at the phone switch exchanges not only X.25 for TCP/IP, but also the file transfer protocol for (S)FTP. The termination of all legacy protocols at the switch simplifies the interface to the centralized host or a dedicated (S)FTP server, which is already connected to the telecom's intranet. No special application interface is required: the PXSe operates as an (S)FTP client and transfers the CDR files directly to the collector, the (S)FTP server.